Journeying on a Sacred Water Purification pilgrimage with a Traditional Master Healer encompasses mysterious and ancient rituals to cleanse our being and eradicate negative and often unseen forces that might overshadow our life. This unique spiritual journey will guide you through a genuine purification healing ritual with a Balinese priest who will help explain this deeply symbolic experience and prepare the necessary offerings and seek a blessing for you. Many report this as their foundational Balinese experience; a significant journey which positively influences long after the event. At Mirah Delima Institute, you will meet your Journey Master and discuss your interest in the water purification journey and what you are hoping to experience through this ritual. The Master will also identify the particular approach that will best align with your interests and needs, including consideration for any mobility matters to access the site. Additional locations for specific sacred water purifications are available and are discussed through consultation with our Master prior to starting the journey. 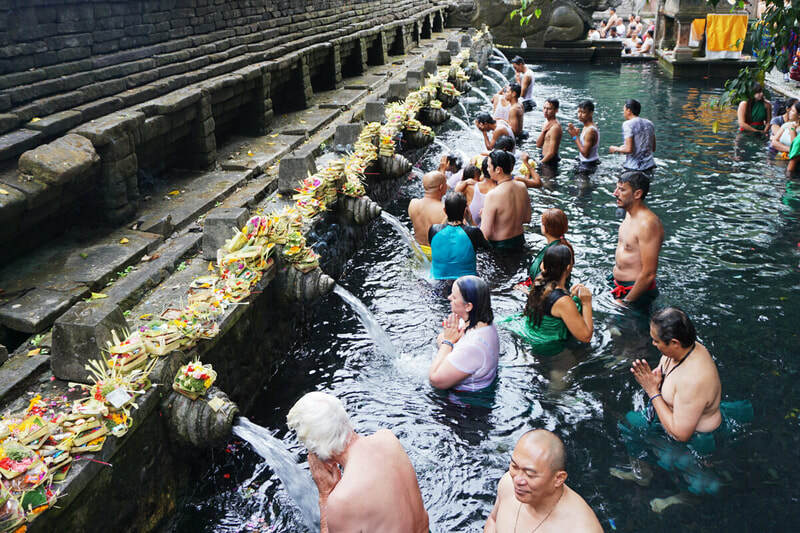 There are several places with natural Holy Water Springs that are available for the purification ritual depending on your needs; this may be held on the beach, at a Holy Water Spring, within a temple or at our High Priest’s house & temple complex for a special ritual. Following consultation, our Master can discuss options and suggest the appropriate place to hold the sacred purification ritual and the best time to depart from your villa or hotel. We will start with a debrief to explain the journey and to meet the Journey Team and Master/s who will guide you. We set the intention for your journey with a short prayer. Travelling to the site, our Master will explain the history of the water temple or Holy Springs, and how we provide the correct offerings and prayers for the purification process and guidance on temple etiquette. 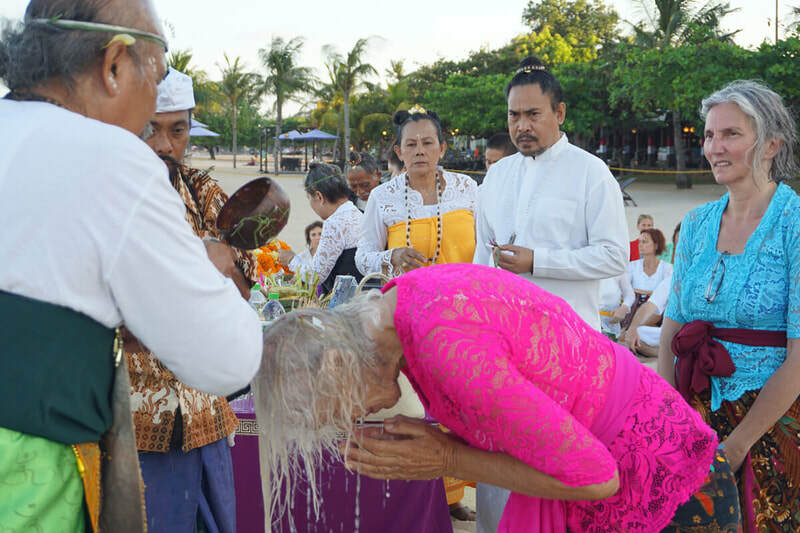 Changing into a ceremonial sarong and waist tie (provided for your use by MDI), and undertaking a small ritual at the shrine, we then proceed to the Holy Temple or Holy Water Springs. Our Master will provide guidance on the purpose of each fountain and how to access the natural energy of each for purification and clearing blocks. After changing into a dry sarong and a ceremonial waist tie (provided for your use by MDI), we invite you to the main temple to perform a ritual that is led by our Spiritual Master and local Priest. Traveling back to your hotel, the Master can answer any questions and discuss how we can include the simple practice of water purification each day (including remote purification in your home country) by remembering the experience and accessing the temple from your home.